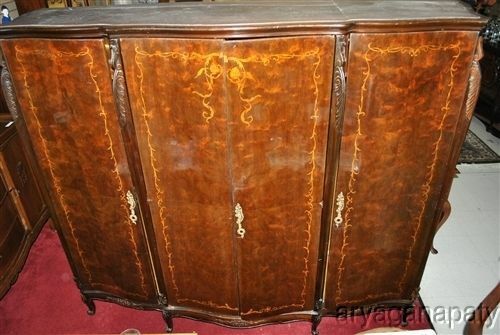 This is a stunning French Provincial walnut armoire with beautiful marquetry work. This wardrobe with built in chest of drawers is in fantastic condition as it is from the roaring 20’s. There are two hanging closets on either side and the center has three drawers with addition marquetry work with space above for shelves or more hanging space. The hardware is heavily ornate solid brass. Over all a beautiful piece. French Provincial furniture was made in the provincial cities and towns many of which, like Lyon and Liège, retained cultural identities distinct from the metropolis. Features typically associated with French Provincial furniture include cabriolet legs, and simple scalloped carving. Dining chairs often have a wheat pattern carving reflecting the country surroundings of the maker. The ladder back chair with a woven rush seat is the typical French Provincial dining chair. Finishes vary though common to all colors is the accumulation of polish or grime in the carving over time resulting in an aged patina and emphasis on the carving regardless of whether the furniture is painted or stained. Marquetry is a form of decorative veneering in which exotic and contrasting woods were cut and fitted together like a jigsaw to form intricate patterns which were then applied as panels of veneer.